RONKONKOMA, NY, UNITED STATES, April 4, 2019 /EINPresswire.com/ -- Sixteen years of operation in the Long Island solar industry constitutes seniority status. 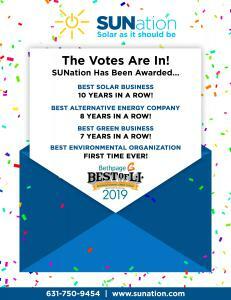 Being voted “Best Solar Business” for ten of those sixteen years is unprecedented, but one local solar installer has done it and they are Ronkonkoma based, SUNation Solar Systems. 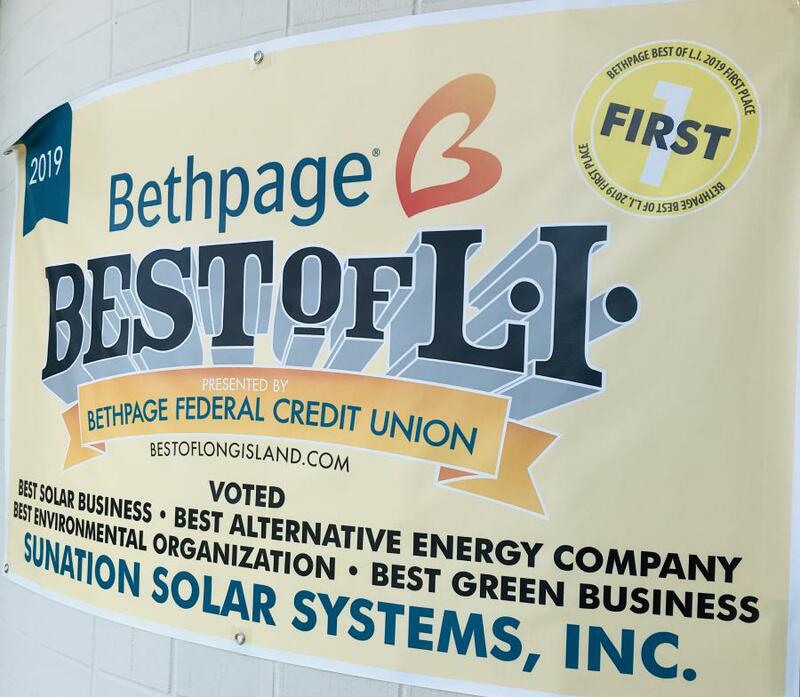 The multi-award-winning company has been voted the 2019 Best of Long Island “Best Solar Business” for the tenth consecutive year, “Best Alternative Energy Company” for the eighth consecutive year, “Best Green Business” for the seventh year running and “Best Environmental Organization” for the first time this year. Since 2005, the Best of Long Island business awards program has been identifying the top resident voted businesses on Long Island. Sponsored by Bethpage Federal Credit Union, the contest reflects fourteen industry categories in which the individual awards are organized. There is an 8-month nomination period for Long Islanders to submit their favorite local businesses. Approximately fifteen nominees are selected to the ballot, and people may cast their votes daily during the voting period of October 1st through December 15th. The winners are announced early in the new year and recognized with the Best of Long Island logo, listed on the website and announced in the Winners Guide publication. The Winners Guide serves as a reliable, one-stop-source for local business recommendations, hand selected by patrons and residents across Long Island. Being a Best of Long Island winner has become a widely renowned and coveted recognition, enhancing a company’s branding and lending trust and credibility to the business name. Hence why SUNation continues to secure their place as the official frontrunner of the Long Island solar market. With customer referrals accounting for a substantial portion of their business, SUNation’s unparalleled customer experience, dedication to quality service and workmanship, and personalized approach to each and every job has proven a successful practice for their sustained triumphs. It is not by chance that Long Islanders repeatedly vote for the company year after year; there is deep rooted reasoning behind these victories. “Our customers are not just customers; they are neighbors, family and fans of SUNation. Our employees are the same, and that is because we put work culture and customer experience at the core of our philosophy. We treat each customer as our only customer and invest in the resources that ensure happy and fulfilled team members,” says Scott Maskin, CEO of SUNation. Despite holding position as the Best of Long Island, multi-category reigning champion, SUNation mindfully counts their blessings with each win, recognizant that their incomparable network of customers, employees, business and non-profit partners, acquaintances, friends, family and neighbors are to thank for their success. Winning Best of Long Island is an honor that has become synonymous with the SUNation name. Scott reflects, “SUNation’s heart beats for Long Island. As a local, family owned and operated solar company, you can be sure that we care about our community and its’ future. That is why this award means so much to us. It is Long Island’s way of reciprocating their appreciation for us. It signifies SUNation’s dedication to serving this community, and for that we glow with pride.” With each recognition, SUNation is assured that their company mission and philosophy are being surpassingly implemented, and they are privileged to be acknowledged as the torchbearers of solar energy on Long Island. SUNation Solar Systems is the local solar expert trusted by over 4,000 Long Islanders since 2003 for professionally installing the highest quality and most durable equipment. We pride ourselves on our professionalism, customer service and providing the highest level of customer satisfaction. We are your neighbors – we live here, we work here, and we give back to our communities. Our not-for-profit corporation, SUNation Cares, provides the gift of free electricity for life to Long Island veterans and their families. We strive to make Long Island a better place to live for generations to come through clean, efficient solar power. SUNation has earned “Best of L.I. Solar Business” for ten years running, “Best Alternative Energy Company” for eight years running and “Best Green Business” for seven years running, “Best Environmental Organization” for 2019, and we boast an A+ rating from the Better Business Bureau.